Orlando, FL – September 22, 2015 – The Florida Association of Chamber Professionals (FACP) evaluated several Chambers throughout the state of Florida for their annual FACP awards. Chambers throughout the state of Florida, ranging in size and concentration were nominated for these awards, with only a handful taking one home. 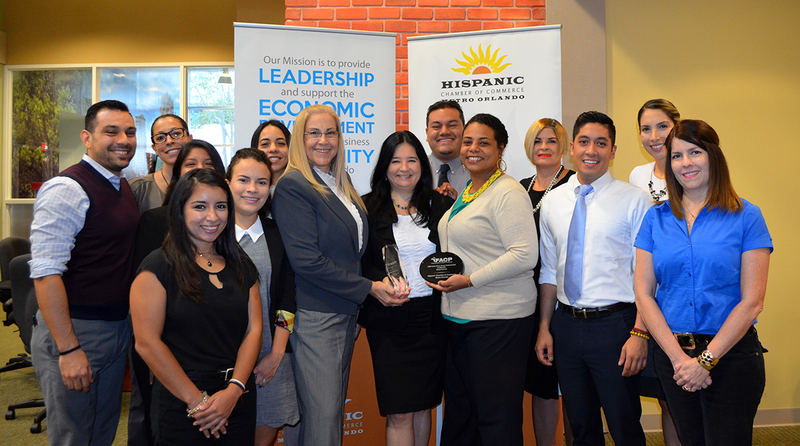 Throughout the different categories for nomination, it was Orlando’s Hispanic Chamber of Commerce (HCCMO) that would take home the FACP Communications Award, and its President, Diana Bolívar, the FACP Executive of the Year Award. These awards highlight different aspects of the Chamber Profession, and are set to recognize those who excel in a variety of functions. Communication is an essential function for any organization that wants to thrive in a constantly cluttered market. Chambers in particular must develop ways to engage its members and the community. In an evolving digital world, the HCCMO has been able to ensure that their communication is delivered through as many mediums as possible. By adopting change, the HCCMO has been able to reach key milestones in its communication efforts, and has been recognized by the FACP with the Communication Award. Such milestones include a redesigned website, a visually appealing electronic newsletter, and maintaining engagement throughout the year with the use of video and social media. The HCCMO has been a previous recipient of the Communications Award in 2013 and 2009, for outstanding communication and marketing material. However this is the first year where its leadership is recognized for the Executive of the Year Award. The Executive of the Year Award is bestowed on an executive (President, CEO or Executive Director) of a Chamber of Commerce, who has demonstrated qualities of a great leader. The criteria for this award included success in maintaining strong internal administration, the ability to maintain and increase membership, and an enhancement of the chamber profession among other factors. “It is a privilege and an honor to be recognized among your peers. We continue to strive for excellence and innovation at the HCCMO for the benefit of our members and the business community,” Bolívar said. In addition to being at the forefront of the Hispanic Chamber of Commerce of Metro Orlando, President Bolívar is a highly active and engaged citizen of the Orlando community. With her involvement on numerous boards, advisory councils, and committees in local organizations, she has been able to impact business and economic growth throughout Central Florida; demonstrating the qualities of a community leader and Chamber professional.